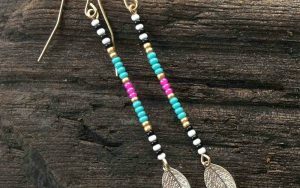 We love gemstone chips. 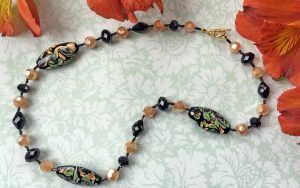 They are real gemstones, but much more affordable than faceted gemstone beads. And we think they can be just as pretty! 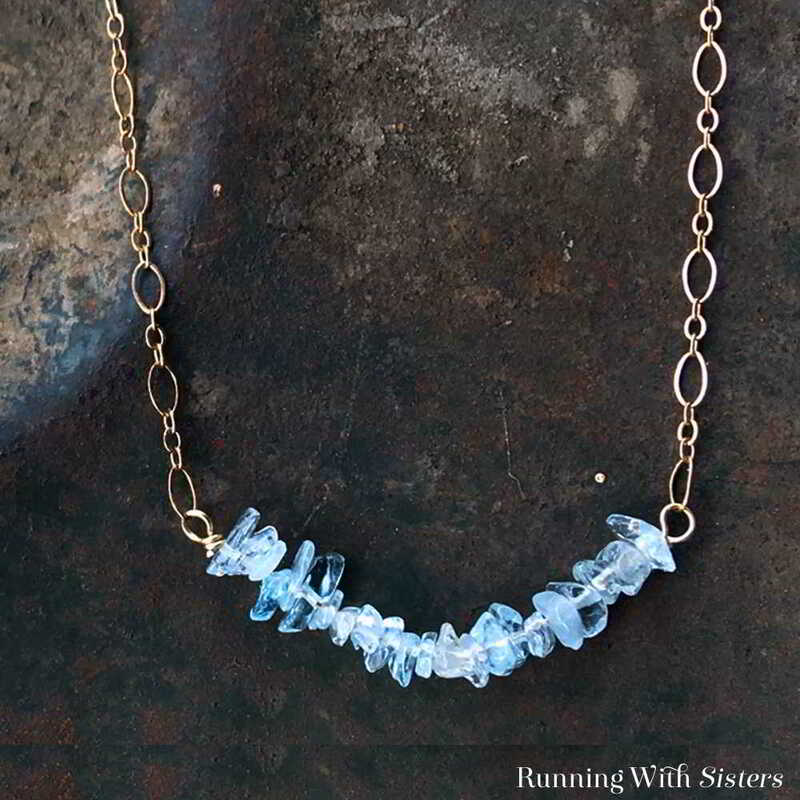 This Dainty Aquamarine Necklace is made with a little wirework and two pieces of chain. 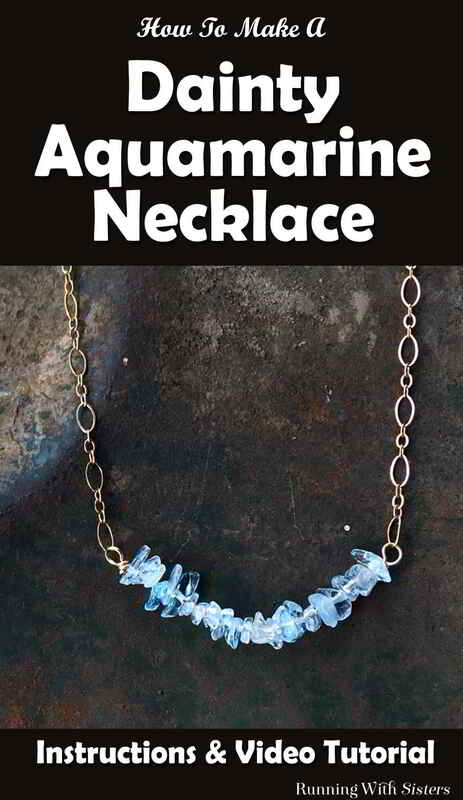 Here’s a video we made showing how to make the Dainty Aquamarine Necklace. 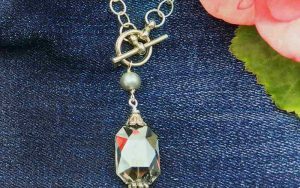 We’ll show you how to make the bar of aquamarine gemstone chips and how to connect it to the chain. Follow along on the video, then use the tutorial below to make your own! 1. Cut a 4″ piece of wire. Make a loop in one end. 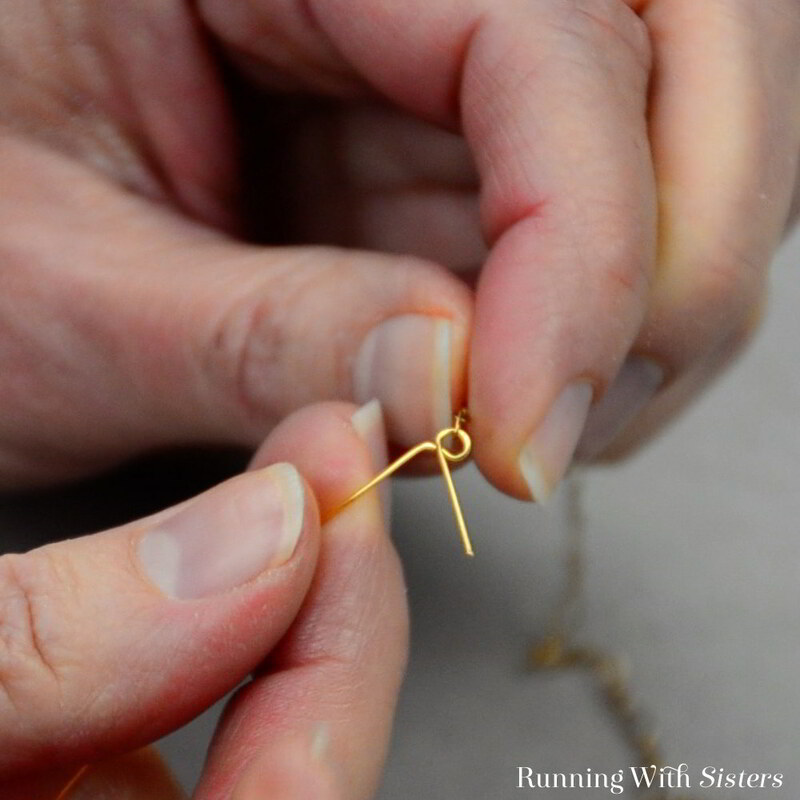 To do this, grasp the wire about 1″ from the end. Pull the tail toward yourself to make a 90-degree bend in the wire. 2. 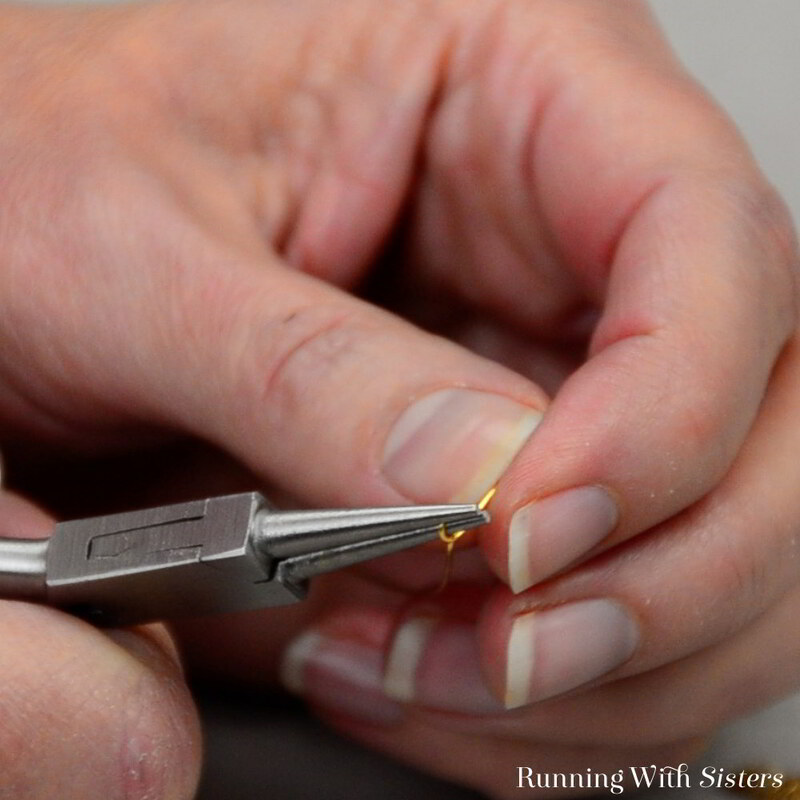 Reposition the round-nose pliers to the top of the 90-degree bend. 3. 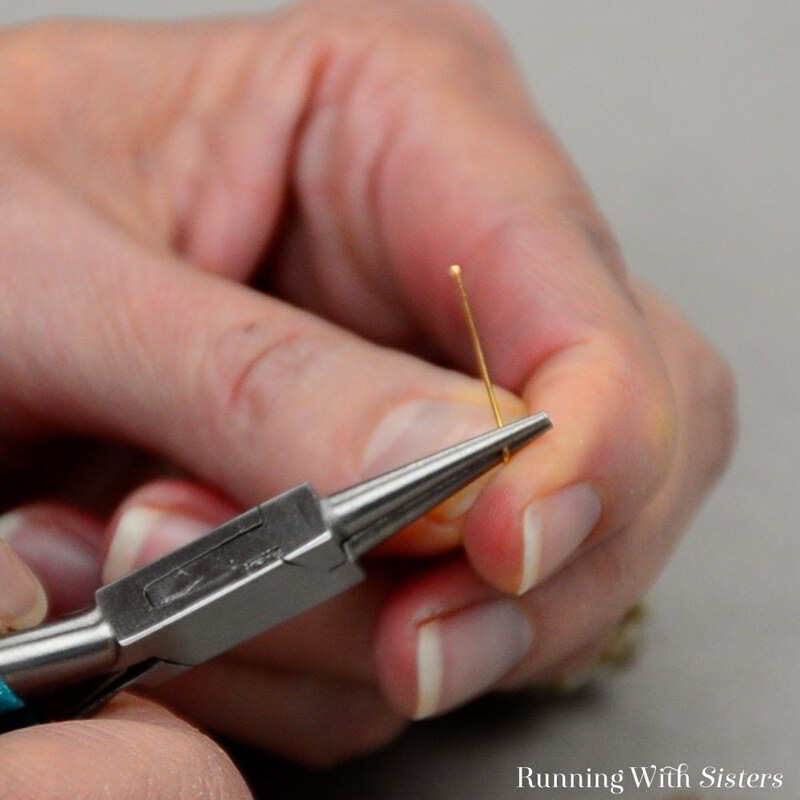 Pull the wire around the top jaw of the pliers in the opposite direction of the 90-degree bend. 4. Slide the bottom jaw of the pliers into the partial loop. 5. Finish pulling the wire around to complete the loop. Nestle the last link of one end of the chain into the loop. 6. 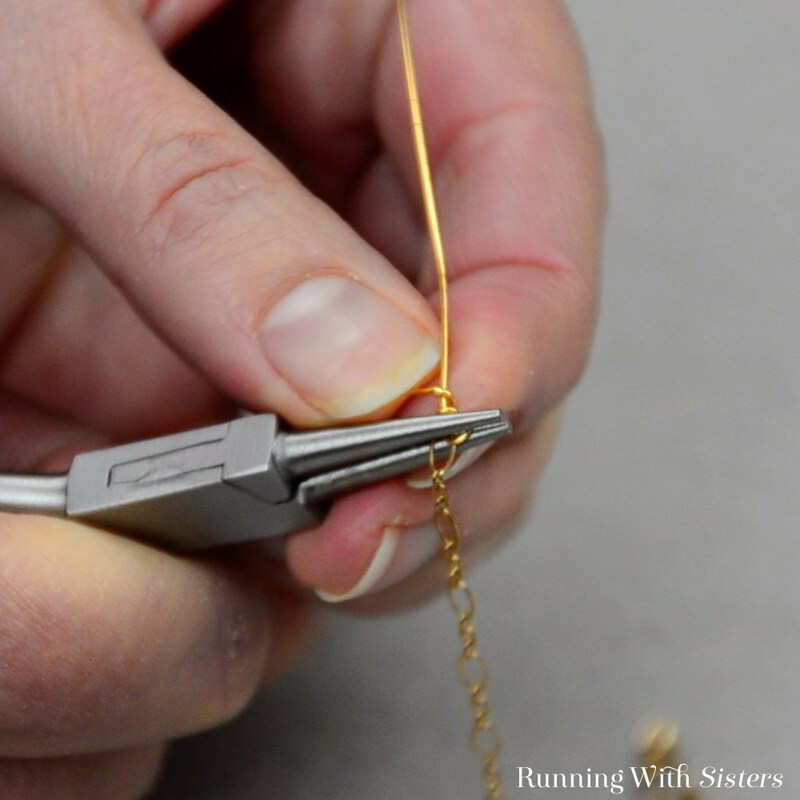 Hold the loop with the round-nose pliers and use your fingers to pull the tail of the wire around the neck two times. 7. Trim the end of the wire with the wire cutters. 8. Gather the gemstone chips in the palm of your hand. 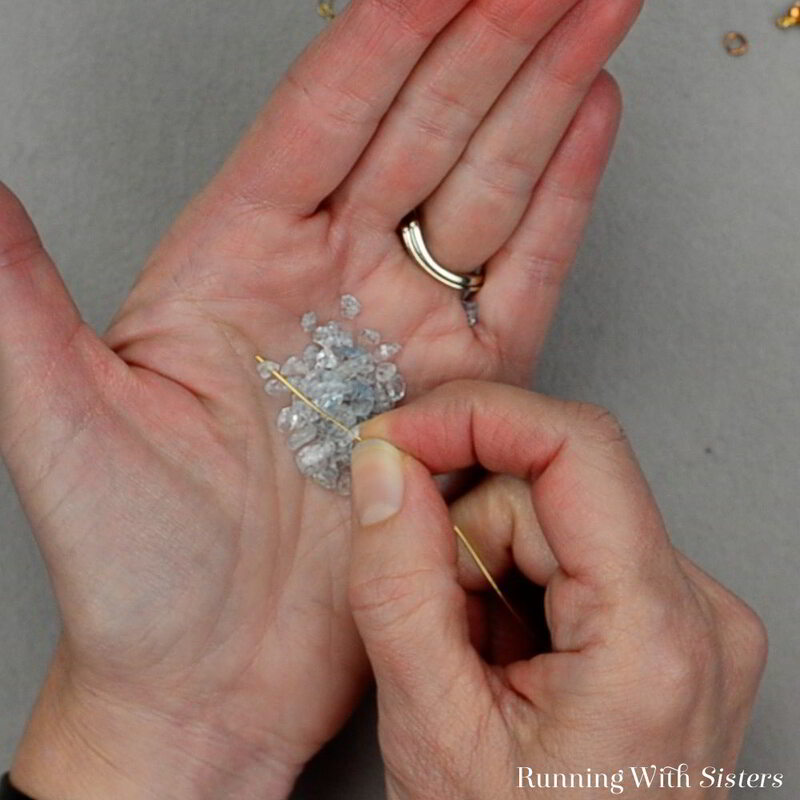 Then use the other end of the wire (that you just made the loop in) to fish the beads out of your palm and onto the wire. 9. When you have about one and a half inches covered with the aquamarine gemstone chips, make a wrapped loop in the other end of the wire. 10. 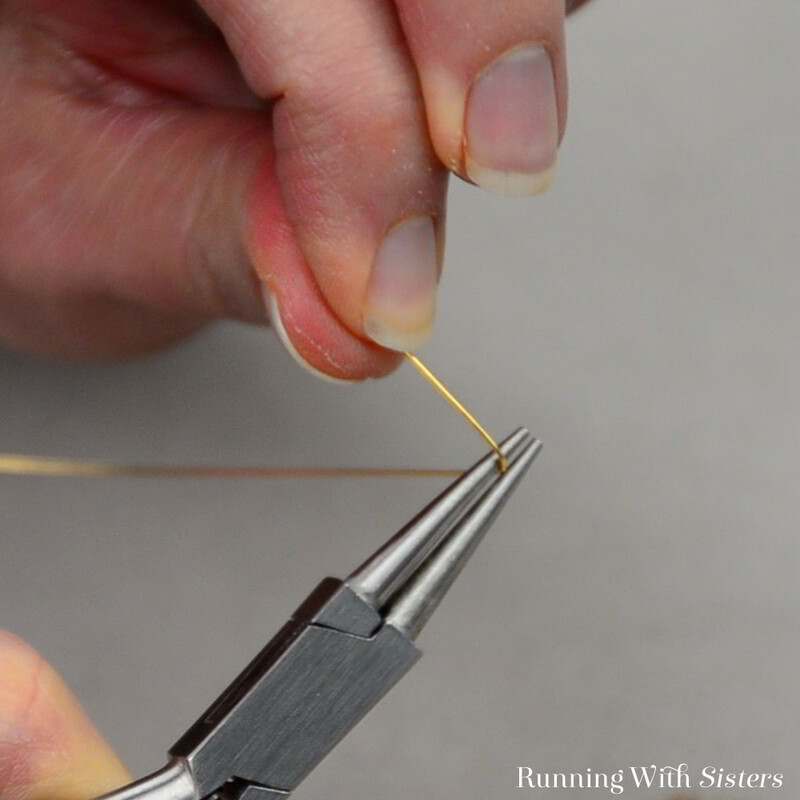 To do this, grasp the wire with the round-nose pliers and pull the tail to make a 90-degree bend in the wire. 11. 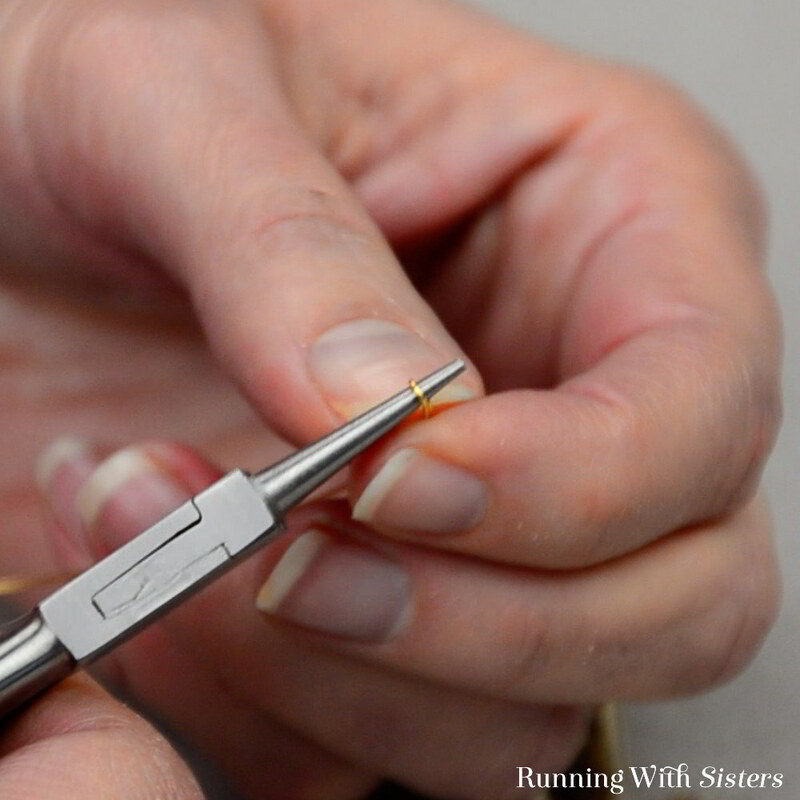 Reposition the round-nose pliers to the top of the bend. 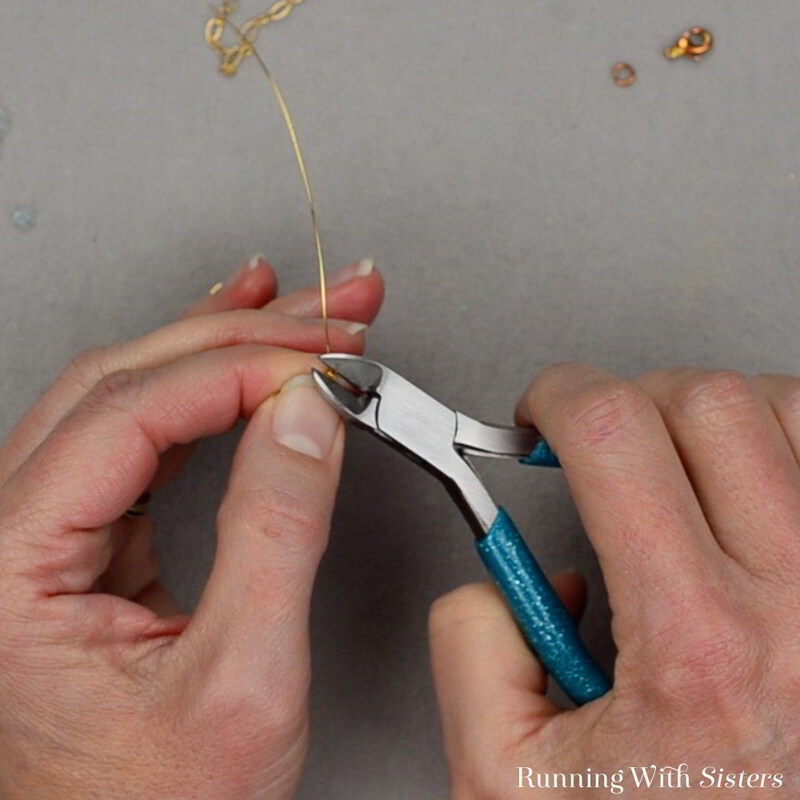 Pull the tail of the wire over the top jaw of the pliers to make a partial loop. 12. Place the bottom jaw of the pliers in the partial loop. Finish pulling the wire around to complete the loop. 13. Slide the end of the other piece of chain into the loop. 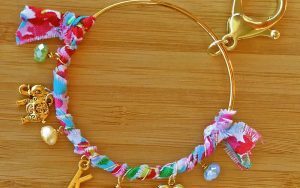 Attach the lobster clasp to the other end of the chain using the jump ring. 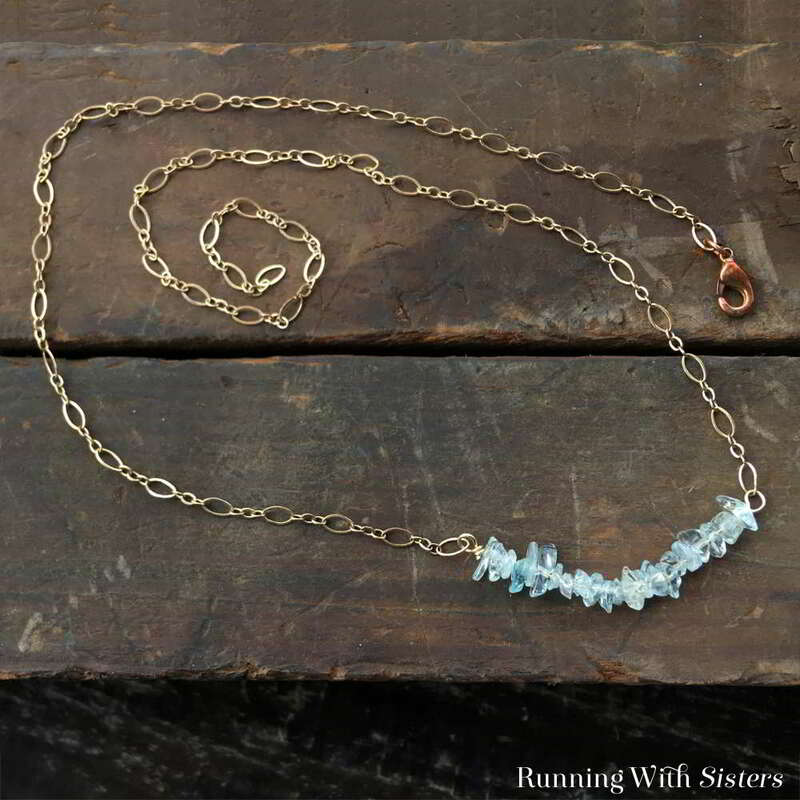 We think this Dainty Aquamarine Necklace turned out so pretty and elegant! 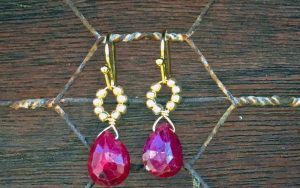 Let us know if you make one and what kind of gemstone chips you used. pretty and not too many steps and not too many “different “materials”…Great and very steady & quick! A easy to follow and do with 9 year old grandaughter!Well done!